At first, Brynn jumps at the chance to help the school in its mission to rid the city of corrupt officials--because what could be better than giving entitled jerks what they deserve? But that's before she meets her mark--a senator's son--and before she discovers the school's headmaster has secrets he'll stop at nothing to protect. As the lines between right and wrong blur, Brynn begins to realize she's in way over her head. 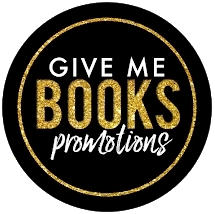 I was lucky enough to win a contest Kristen Simmons had going on a few months ago involving Vale Hall acceptance letters for a handful of winners and one signed ARC for some unsuspecting fan, me. The fact that I received an ARC in no way influenced this review (I'd already sent in an order for a copy for my kindle!) but the FTC requires us to tell you if we receive review copies. I WAS GOING TO REVIEW THIS ANYWAY, FTC! But, look at my cute photo of the ARC and the promotional Vale Hall patch. I honestly didn’t want to finish The Deceivers, I didn’t want to say goodbye to the characters or leave Vale Hall. So, I procrastinated and made Manatee a Vale Hall bandana to wear while he’s working using a promotional Vale Hall patch that I was sent for the book’s publishing day. I first learned about The Deceivers when I stumbled across a tweet by Kristen Simmons about some ill-informed reviewer who accused her of pandering to the people and overloading her book with diverse characters for “diversity brownie points”. I swore then and there, I was going to buy a copy and scream about all the diversity brownie points that I love. And look, here I am, with a virtual bullhorn. 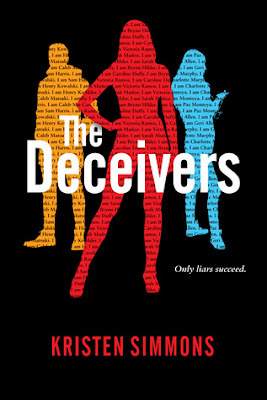 I thoroughly enjoyed my time reading The Deceivers, this entire book centres around The Con and is a veritable Gordian’s Knot of cons. From the opening scene where our protagonist executes a simple 5-minute con on three dance students and comes away two hundred dollars richer, to the humdinger of a con that made me exclaim “what the hell, dude? !” at 2AM and the cons the students of Vale Hall learn in class and apply on their assignments, you will not be bored reading this. Brynn is a mixed girl from Devon Park, a no-income area of Sikawa City. She has a plastic pencil case box in her hollowed-out mattress that she stashes away cash that she earns conning people uptown, all of it’s for college and getting the hell out of Devon Park. As someone who lives the Devon Park lifestyle, I know exactly where Brynn is coming from except, I stash my money in my bookcase. I’ll be honest, if some random arsed old white guy offered me a golden ticket to a bright shiny future and freedom from my past, I wouldn’t even question those nasty little puppet strings he’s tying onto my limbs. But Brynn’s moral compass isn’t as charcoal grey as my own, that girl questions everybody and everything. I was in love with the concept of a private boarding school for budding young con artists because, like I’ve mentioned before, half of my childhood dream jobs were not very law-abiding in nature. I was, however, a tad disappointed that there weren't more Con 101 lessons, but I understand why from the Responsible Adult viewpoint. If y'all want more Crime 101, watch Leverage and White Collar re-runs or something. Don't lie, I know you love them as much as I do. Brynn is assigned the task of getting close to a Senator’s son and finding some dirt, any dirt. And as the con goes on, the lines start to blur for Brynn who’s used to running short cons, not long cons. She struggles with maintaining her multiple covers as Sarah, the bad girl who’s caught Grayson Sterling’s roving eye at a party, Brynn Hilder, the newest student at the prestigious boarding school who left Devon Park behind, Brynn Hilder, the girl being hunted down by her mom’s drug dealer boyfriend, and just Brynn. Y’all. I'm pretty much here for Brynn and her ability to balance The Con, starting a new life and trying to keep track of her old life and all its drama and still remembering that she is not a bad person at her core. I can barely remember to put on pants before walking the dogs in the morning. Two words, readers, door pants. The Vale Hall Ravens are comprised of no more than twenty students at one time, but the story centres around the newest addition the Vale Hall, Brynn Hilder, as she goes about acclimating herself to her new life as a Raven. She forms friendships with a few of her new classmates/teammates but she's also wary of fully trusting any of them as she knows that if her past catches up with her and her cover as a student at a prestigious prep school is blown, she's screwed with nowhere to land since she burned her bridges back in Devon Park. And I can understand it, she doesn't want to go back to her dead-end school in her dead-end life and end up working at the sports bar with her mom for tips and go to a dead-end community college for a less-than-stellar diploma that won't hold up against someone else's fancy uni degree. Oh, look, that leads us to characters! I do love dishing about characters! 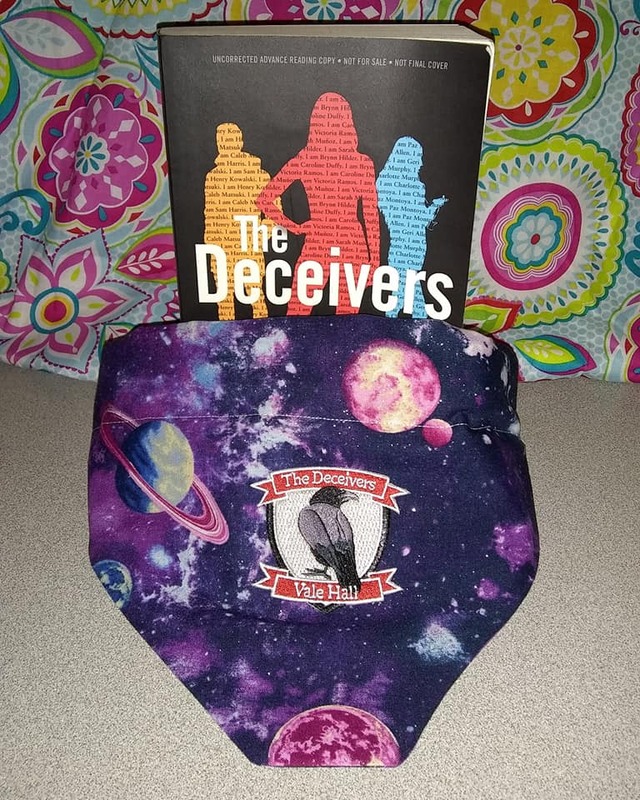 I found the central characters of The Deceivers well-developed and I had separation issues when it came to the end of the book. I just didn’t want to say goodbye to them. Brynn was your not-so-typical scrappy mixed-race protagonist with a burning desire to get the hell out of her neighbourhood and go to college and never come back. I totally related with her. My favourite character after Brynn was Henry, I love puppy dogs and Henry is the loyal pup you rescue from the pound and he smothers you with love and affection no matter what. He’s loyal to Caleb and loyal to Brynn and he’s ecstatic when he sees a smidgen of a connection between the two and will play cupid any chance he gets – any. Speaking of Caleb, Caleb is another mixed-race character and a pretty good chameleon. He goes from adorkable to not-bad boy hottie in seconds and I’m still not sure which I like better. Either way, that boy is Campbell’s Soup. (Yes, I did put that. Judge away. I never said I was cool.) Next, we have Charlotte. Charlotte is Brynn’s friend, dorm neighbour, and a mentor of sorts for her as well as she struggles to get her feet under her at Vale Hall. And I just want to make Charlotte some of my Chocolate Addict Cookies and set her in front of the telly for a Gilmore Girls session, okay? My least favourite characters in The Deceivers were Geri, Dr Odin, and Pete. Geri is Vale Hall’s resident Mean Girl, she could have made Regina George cry. She was just flat-out horrid to Brynn from the get-go. And Dr Odin was a shark disguising himself as a friendly dolphin. He acts friendly, but time and time again, there were little hints of the teeth. And what kind of grown man sends kids out into dangerous situations with sketchy people to find dirt for him in exchange for whatever the kid desperately wants or needs? This is classic abuser grooming behaviour and I'm honestly afraid for the Ravens' and how Dr Odin would react if they were to fail him in a major fashion. Pete is Brynn’s mom’s abusive dirtbag boyfriend who’s a drug dealer and he’s all sorts of nasty and I would just really enjoy setting that offal-masquerading-as-a-human-being on fire. I did love the diversity we saw in the characters and in some of the scenes (you’ll know when you read!). There are POC and culture and it isn’t a ‘trying too hard’ thing. It is having characters of colour and letting them be themselves. This book is colourful, and I love it for that! Kids like myself and the author need books that have main characters that are like ourselves, just like everybody else, mixed and living their lives, some of us basking in our various cultures and others just acknowledging their heritage occasionally. It’s all good and that’s some representation I adore. And that’s my little soapbox moment. Now, The Deceivers was born from Norse mythology (it is not a retelling, people, listen!) and there are so many obvious nods to the lore throughout the book. The biggest nod of all is, of course, The Con, since Norse deities were famous for tricking one another. Okay, they were famous for the bloodshed too, but we’re talking cons. The Con is the theme, okay. Our protagonist is Brynn Hilder and she gets her name from the famed Valkyrie, Brynhildr. The god, Odin, the all-father, would send his ravens, Huginn and Muninn, out to collect information for him so he could become the wisest of all. Likewise, Dr Odin sends Vale Hall’s Ravens out to collect secrets for him to use to make the world a better place. I shan’t go further on this vein though, because I want you to dive into The Deceivers and see if you can spot other nods to the pantheon and the legends surrounding them. Now, this is a rather long review and I apologise, I apparently had a lot to say and I’ve rewritten this a few dozen times trying to shorten it but we’re over 1400 words (1433!) and I’m saying we’re done before y’all start finding some pitchforks and torches. 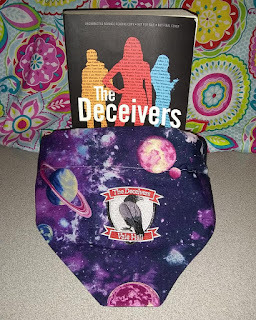 I’m giving Kristen Simmons’ The Deceivers 5 stars of gloriousness because I loved this book from start to finish and Ms Simmons managed to slip a con past me when I thought I knew everything. So, I tip my hat to her. I recommend this book to anybody who is looking for a YA read that is a smidgen romantic, a bit of a mystery, a little reminiscent of Leverage (if you haven’t seen Leverage, we need to talk, honey), and is a definite thriller. Also, have a random weird gif because I've been very gif-less of late and I apologise. 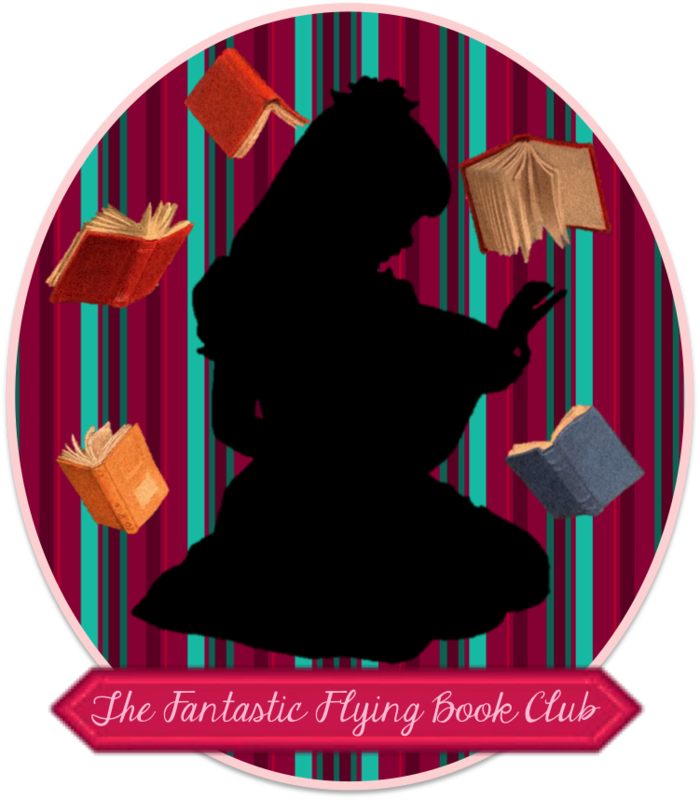 This post's charity of choice is Children's Literacy Initiative which is a non-profit working with pre-k through 5th-grade teachers to improve early literacy instruction so that children from disadvantaged backgrounds can become powerful readers, writers, and thinkers. If you're of a mind to make a donation and possess the means to do so, I'm sure CLI would put it to good use. As always, darling readers, have a happily ever after!